Your home is your sanctuary. It's where you go to relax and recharge. When you are cleaning your home, the products you use are important. You don't want to expose your family to harsh chemicals. Using products that use natural products are best in my opinion. I learned about a company called Jenuinely Pure. They are a family owned business that makes cleaning products, baby products and skin care products. I had the chance to try out some of their products. I tried the Bar Soap in Vanilla Bean. I was really impressed with the lather the soap created. I had been using body wash for years. I love the way the bar soap smells too. Noah has been using it too. Bar soap is easier for kids because they don't have to worry about spilling it or using a bunch of it. He can even use it to wash his hair. I also tried out the Foaming Hand Soap in Citrus. I have been on a citrus kick lately. It smells so refreshing. I wash my hands a lot so it's nice to have a great product to use. Noah likes it too. I love that it's a foam hand soap because it seems to last longer but still get the job done. I tried the All Purpose Cleaner too. There are so many cleaners out there. If you go to the store, there's a whole aisle of them. There's so many chemicals that I don't feel comfortable having in my home around my son and cats. It's great knowing that I can use Jenuinely Pure and know that my counters are clean and my food is safe. The last item I tried was Soap Nuts. I had never heard of Soap Nuts before. Soap nuts are berries that grow on trees in India & Nepal. They contain large quantities of saponin in their shells, which acts as a natural, gentle detergent when it comes into contact with water. 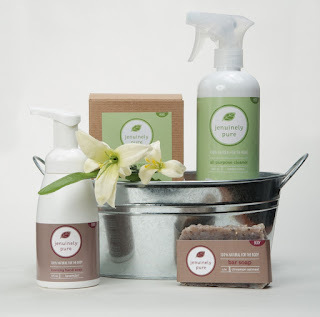 Without any chemicals, fragrances or dyes, they are safe and gentle enough for hand washing delicates. I like using them on my delicates. I think that they are also really neat. Noah and I had a great conversation about how they are nuts but they clean your clothes. We were being silly and talking about if other nuts could clean our clothes too. We decided probably not. For more information and to order please visit Jenuinely Pure.